Booklet and catalog titles these days are not merely rendered in two dimensions anymore. With the advent of hi-tech digital imagery, we see more and more special covers for booklets, catalogs and brochures that have three dimensional looking graphics and text elements. This is in line with the trends in digital design seen on the web, and are now actually spilling over to print media. In this tutorial we will teach you how to turn your design titles into three dimensional type text. Just follow each step and you will not go wrong in how to do it. So let us start with creating the document first. 1. Start by creating a new document. Go to File -> New… to open the New document dialogue window. 2. Set the size (width and height) that you need for your design. Take note that these are measured in pixels, but you can change them to inches by just clicking on the drop down menu of the measurement type. For prints, a resolution of 300 pixels/inch is recommended. For web images 72 pixels/inch is good. Press OK once you are done. 3. Now, let us get to creating your text. For 3D text, it is best to choose large type or fat type fonts. Script fonts are not ideal of course as you won’t get a clear three dimensional look, though of course, you can try and experiment for yourself. 4. 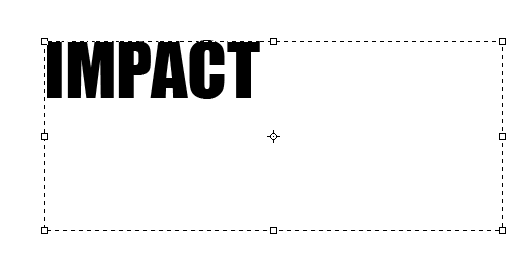 In this tutorial we will be using the font IMPACT in our text, as it is a nice simple blocky type text. 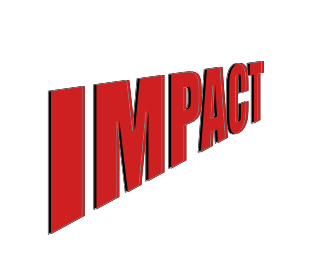 Just choose something wide and blocky for your own 3D text base. 5. Now that you have the text, ready, we will want to add some perspective to it to make it appear to be in a three dimensional environment. First though, make sure that your text has no misspellings. Also make sure that it is the right title or word that you want to use, as we are going to convert the text into a shape and by then you cannot edit the text readily. So make sure that your text content is in its final form. 6. Once ready, right click on the text and select “convert to shape”. You will now see that your text layer becomes a vector shape. 8. Note that you will see box handles in the transform selection box. Click and drag these box handles to transform your text in the proper three dimensional perspective. Just experiment with it. (remember that you can always go back to the original untransformed shape by pressing the ESC key) Once you are done, Press enter to commit the transformation. 9. Now comes the sort of tricky part. Duplicate the layer that you created. Just right click on the original text layer and select duplicate layer. 10. Next, change the color of this new layer, to make it distinct from the original. Do this by double clicking on the colour layer thumbnail of the layer and choosing a solid color. 12. Doing this instantly creates a new layer copy of the selected layer. 13. Now, we are going to move this new layer a bit to make it part of the 3D effect. Click on the move tool or press “V” to be able to move your new layer. 14. The easiest way to accurately move your layer is to just use the arrow keys. With the layer selected, simply tap the arrow keys in the selected direction that you want. In our case, we would want to tap the left arrow key, as the 3D body of our text should protrude there. 15. Here, we pressed the left arrow key just three times to get the effect. 16. Now to get the 3D effect to be thicker, we will continue on creating duplicate layers and then nudging those new layers each by one. Do this by pressing CTRL+J and press the left arrow key once, over and over. 17. So the order of pressing it should be CTRL+J, Left Arrow key, CTRL+J, Left Arrow key. 19. Now that looks like a 3D image already. 21. Next, add a color overlay blending option to the merged layer. Do this by right clicking on the merged layer and then picking blending options. 22. Click on the option for Color Overlay, and then choose a color that matches your front colour layer. 23. Once done, you should see a nice 3D type looking text. Now all you have to do is to customize the colors and the angle of your text perspective to get the 3D effect that you need in particular for your own designs. Good Luck! Visit www.PrintPlace.Com for more tutorials like "Creating a Logo Reflection Design" and tips on creating brochures.